The key takeaway for Bitcoin HODL’ers is that the SEC has not rejected blockchain, BTC or the possibility of a BTC ETF, just this version of a BTC ETF. The SEC says there are still issues with security, market manipulation and investor protections that need to be addressed. Proponents of this and other forms of BTC ETF argue the acceptance and listing of such a product would alleviate many of those issues. Meanwhile, the VanEck/SolidX application to list a BTC based ETF is still under review. The joint venture was officially proposed in a letter to the SEC early in July with a comment period currently in effect. Traders and investors alike have stepped up in favor of the listing citing many benefits to the public. Based on SEC regulations the agency has 45 days to respond to the request which means we will be getting more US related BTC news within the next 2-3 weeks. There are also at least six other applications for BTC ETF’s in the works. The NYSE/ARCA has requested the listing of five ETF products ranging from a simple BTC tracking stock to highly leveraged positive and negative return ETFs based on the same. Most recently Bitwise, a cryptocurrency asset manager, has requested to list an ETF based on a basket of cryptocurrency. While the SEC is not expected to accept any of these requests in July, they are expected to grant the listing of BTC ETFs in the not too-distant future. Bitcoin surged in the last week, breaking above a key down-trend line, on the hopes (at least partially) that the SEC would indeed grant requests for a BTC ETF. The Winklevoss news took steam out of the rally, sending BTC down about -2.5%. The move is bearish but did little to alter near term trends which are pointing to higher prices down the road. 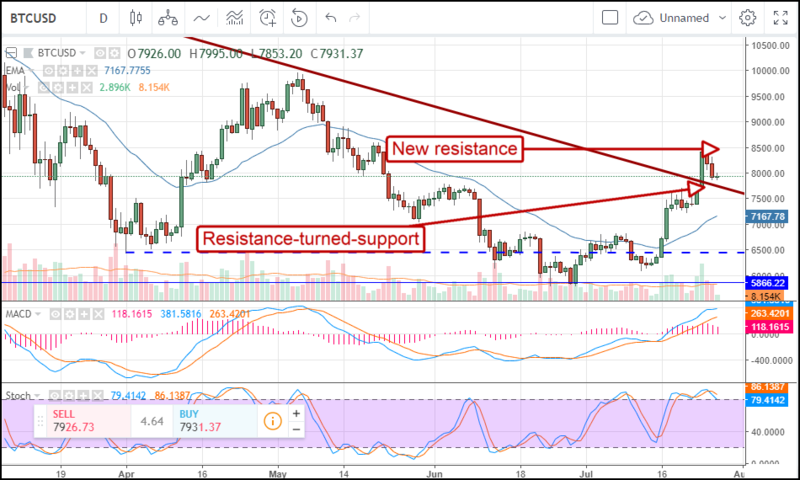 This week’s action has resulted in a retest of resistance-turned-support that will ultimately help the coin form a base from which it can rally.